Chief Complaint: 39-year-old white male contact lens wearer is referred to the University of Iowa Department of Ophthalmology with cloudy vision, photophobia, and a red, painful right eye. History of Present Illness: The patient is a contact lens wearer who has used disposable soft contact lenses for the past 3 months. Three weeks prior to presentation at the University, the patient began to develop cloudy vision, photophobia and increasingly exquisite pain in the right eye (OD). Pain increased to 8 out of 10 on a pain scale, despite topical antiobiotic therapy at an outside facility. When the patient presented to the University of Iowa, he was on Gatifloxacin and Tobramycin drops every hour and cyclopentolate 1% twice a day (BID), OD. Despite this therapy, the ulcer in the right eye persisted and was worsening. Past Ocular History: The patient had switched to disposable soft contact lenses 3 months prior to presentation. Medical History: Mild hypertension and hypercholesterolemia. Medications: Topical Gatifloxacin and Tobramycin every hour, OD, as well as cyclopentolate BID. His systemic medications included Valsartan and Atorvastatin. Social History: Rare social consumption of alcoholic beverages. Patient is a non-smoker. OD: 4x4 mm stromal ring infiltrate with surrounding white blood cell (WBC) infiltration. Keratic precipitates line the endothelium inferior to the ring infiltrate and there is a 0.5mm hypopyon. Small defects in the epithelium are present over the area of ring infiltrate. Enlarged corneal nerves (radial perineuritis) are also seen on high magnification. There is 4+ conjunctival injection and the anterior chamber is filled with 3+ cells and 2+ flare reaction. Dilated fundus exam (DFE): Very difficult and hazy posterior view, OD. Normal disc, macula, vessels, and periphery, OS. Video 1: Classic ring infiltrate of Acanthamoeba is demonstrated. Hypopyon and conjunctival injection can be seen. Additional Tests: Based on the history and clinical examination, Acanthamoeba keratitis must be suspected. This patient's results are described. Confocal microscopy was performed in the clinic. The images were highly suggestive for Acanthamoeba keratitis. Double-walled cysts were found within the stroma. Inflammed posterior corneal nerves were evident. Bright structures with spindle-like pseudopodia were visualized within the basal epithelium consistent with Acanthamoeba trophozoites (see confocal microscopy video, Video 2). Epithelial scraping was taken and sent to the Ocular Pathology laboratory at the Univsersity of Iowa for evaluation of Acanthamoeba. In this case, double-walled cyst structures were seen within the epithelium (see Figure 1). Multiple swab samples of the underlying stromal surface were taken and sent for pan-culture. No secondary organisms grew. Video 2: Confocal microscopy, OD, showing inflamed corneal nerves, double-walled cyst structures in the superficial stroma, and the bright reflection of Acanthamoeba trophozoites within the basal epithelium. Course: History, clinical examination, and confocal microscopy all suggested Acanthamoeba keratitis in this soft contact lens wearing patient. 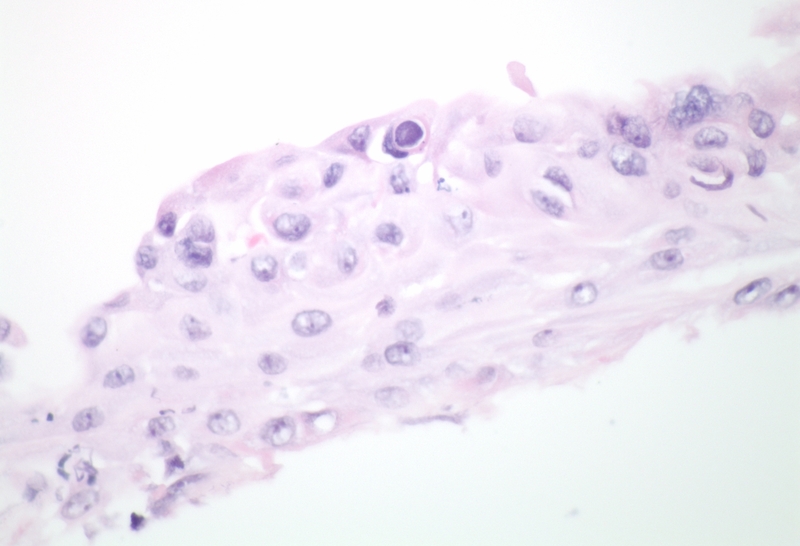 Histopathologic examination of the epithelial scraping confirmed the diagnosis when double-walled cysts were found (see Figure 1). At presentation, the patient was started on chlorhexidine (CHX) 0.02% drops every hour while awake and oral Itraconazole 200mg BID. Mydriatics were continued for comfort, but the antibiotics were tapered and stopped when bacterial and fungal cultures proved negative. In follow-up appointments, the cornea further opacified, with white opacities forming around the peri-limbal cornea. Visual acuity was reduced to hand motions secondary to persistent dense stromal infiltrates. Polyhexamethylene biguanide (PHMB) drops were added four times a day (QID). CHX drops were continued every hour while awake and oral azole antifungal was continued. However, the cornea continued to worsen with 25% corneal thinning inferior to the ring infiltrate. The patient was admitted to the hospital for daily intravenous (IV) therapy with Pentamidine. Topical drops were continued around the clock. As an inpatient, repeat corneal scraping again showed intraepithelial Acanthamoeba cysts. Repeat corneal culture came back positive for a new colony of Gram-negative rods. Tobramycin was added as secondary coverage every 2 hours. As some improvement was noted, oral Prednisone (80mg daily) was started. After eight days of inpatient IV therapy and around-the-clock topical medications (as described), the patient showed sufficient improvement to allow return to outpatient therapy. The patient continued on CHX 0.04% and PHMB 0.04% 5x/day, Prednisolone 1% 4x/day, Atropine 1% twice daily, 40mg Prednisone orally each day, and 200 mg Fluconazole daily. Topical antibiotic drops were provided to prevent secondary bacterial infection during periods when there was an epithelial defect. The eye was never totally quiet, with a persisting ring infiltrate, surrounding dense interstitial keratitis, and fluctuating keratouveitis. It was determined that the eye would require a penetrating keratoplasty (PKP) (see Video 3). The surgery went very well and even one day after surgery, the patient had a best corrected visual acuity of 20/70. Histopathology of the corneal button confirmed necrotic keratitis and the presence of residual Acanthamoeba. No other organisms were identified. Video 3: Penetrating Keratoplasty (PKP) for Acanthamoeba keratouveitis. Three months after PKP, the patient was refracted to a visual acuity of 20/25. Post-PKP, the patient was carefully followed in the cornea clinic. Oral prednisone was tapered successfully. Selective suture removal and one episode of resuturing a loose edge of the graft followed in the ensuing months, but recovery went well. Drops were very slowly tapered during this time. Three months after PKP, the patient was refracted to 20/25 and was doing well on a slow taper of drops. At nine-months follow-up, he continued to see 20/25 with best correction, only 2 sutures remained in his graft, and he was using topical CHX and Prednisolone at a maintenence dose of twice daily. The graft remained clear, with no evidence of recurrence. Epidemiology: Acanthamoebae are hearty, free-living, ubiquitous pathogenic protozoa. The organism exists either as active, motile trophozoites or dormant, double-walled cysts. Under duress, the organism converts from trophozoite to the more durable cyst form, making the organism highly resistant to killing by desiccation, freeze/thaw cycles, irradiation, or chlorination levels found in swimming pools, hot tubs, and public water supplies (Sutphin, 2004 and Aksozek, 2002). As a human pathogen, the Acanthamoeba species is responsible for chronic granulomatous encephalitis and cutaneous amoebiasis in immunosuppressed patients, and for severe, painful, keratitis in otherwise healthy individuals. Acanthamoeba keratitis can be severe and vision-threatening. The infection was first recognized in contact-lens wearers in the mid 1970's (Jones DB, 1975). There was a sharp increase in the recognition (and perhaps incidence) of this disease in the late 1980's. Most commonly (in about 80% of documented cases), the infection is associated with contact lens use (Moore MB, 1985). It has been hypothesized that this is related to the corneal microtrauma induced by contact lens wear, since animal studies have shown that the amoeba is only pathologic when the epithelium is compromised (van Flink F et al, 1993). In Iowa, catastrophic flooding in the summer of 1993 (www.nwrfc.noaa.gov) led to the contamination of municipal water supplies and correlated with a dramatic increase in cases of Acanthamoeba keratitis treated at the University of Iowa Department of Ophthalmology. Incidence of Acanthamoeba keratitis was 30 times higher in areas that were affected by flooding. In 2006, the true incidence of Acanthamoeba is not known since many hypothesize that even with current diagnostic techniques many cases go undiagnosed. In 1997, over 750 cases were reported worldwide (Matinez AJ et al, 1997). In a study in 1996 at the University of Iowa, it was suggested that the incidence may be as high as 1/10,000 contact lens wearers per year (Mathers et al, 1996). Presentation: Acanthamoeba keratitis presents with pain, photophobia, decreased vision, injection, irritation, tearing, and a protracted clinical course. Classically, the eye pain is severe and disproportionately worse than clinical appearance would suggest. The patient is often a contact lens wearer. In some cases, an obvious suspicious source of infection can be identified (homemade saline solution, swimming or use of the hot tub while wearing contact lenses, exposure to standing ground water), but more often than not routine contact lens wear may be the sole risk factor. Often, the patient has been treated for bacterial keratitis and without therapeutic response to topical antibacterial agents. Examination early in the disease course may only reveal irregular epithelium, punctate epithelial erosions, dendritic lesions, and conjunctival injection. Later in the disease, stromal infiltrates progress and a classic "ring infiltrate" may develop (see Video 1). Often, because of the early dendritic lesions and a later circular infiltrate, Acanthamoeba keratitis may be confused with herpetic disease and both need to be considered in this clinical picture. Radial perineuritis (perhaps explaining the intense pain) may be seen on slit lamp examination or confocal microscopy (see Video 2). Unchecked, there may be progressive corneal thinning and risk of perforation. Up to 40% of patients may have mild to severe anterior uveitis. Diagnosis: Diagnosis depends largely upon the ability to directly visualize the Acanthamoeba organism, either by confocal microscopy in the living cornea or using light microscopy in histologic specimens. Traditionally, the diagnosis depended on attempts to culture the amoeba on a "lawn" of E. Coli on a non-nutrient agar bed, where the microbiologist would search for tracks of amoeba eating their way through the food source of bacteria. But this is a cumbersome, time-consuming, and costly effort that is not readily available at most laboratories. At the University of Iowa, we rely largely upon the rapid information that can be obtained directly in the examining lane from confocal microscopy combined with the results of corneal scraping analysis by the Ocular Pathology laboratory. With regards to histopathology, there are a wide variety of staining methods reported to identify the Acanthamoeba organism in tissue. Corneal scrapings, smears, or stromal biopsies can be stained with a variety of preparations. At the University of Iowa, we routinely use corneal scraping to obtain a sample and preserve the cells with a cytology fixative (Saccomano) at the time of collection. A cytospin technique is used to prepare the cytology slides. In some labs, these cells are subsequently prepared with Wright-Giemsa, Wheatly trichrome, Acridic Orange, calcofluor white staining, or periodic acid-Schiff staining techniques. At the University of Iowa, we have found that careful examination of an H&E specimen will often allow visualization of the classic double-walled cyst forms (see Figure 1) and identification of the organism. In fact, most ocular pathologists use the H&E stain to make the diagnosis, though the other stains mentioned may be employed. With a good confocal examination and a skilled pathologist, a diagnosis can often be made without taking deep biopsies of the corneal stroma or waiting for cultures to grow. This allows the physician to confidently begin appropriate treatment in a timely manner. At the University of Iowa, experience has demonstrated good results starting with biguanide (CHX 0.02% every hour while awake), in combination with oral itraconazole or ketoconazole 200-600mg/day (divided BID). PHMB 0.02% may be used in combination, as PHMB has been shown to kill both the trophozoite and cyst without toxic effect to the healing epithelium (Larkin et al, 1992). Some have recommended the combined use of Brolene and Neosporin (more commonly used in Europe), and others recommend the use of Brolene combined with one of the biguanides as primary therapy. In Iowa, we have not used this regimen routinely because of the significant corneal epithelial toxicity without any evidence of increased efficacy against the amoeba. Some studies suggest that pentamidine may be the diamidine of choice for Acanthamoeba keratitis because it has equal or better efficacy to Brolene with much less corneal toxicity when applied topically (Alizadeh et al, 1997). In the case we report here, we used intravenous therapy with pentamidine as a helpful adjuctive therapy for a recalcitrant case of Acanthomoeba. This is not a widely used therapy for Acanthamoeba keratitis, but has been used in cases of disseminated acanthamebiasis with some success (Murakawa GJ et al, 1995). Penetrating keratoplasty (PKP) may be required in some cases where maximum medical therapy is unable to halt the progression of disease. PKP in a cornea with residual Acanthamoeba carries with it a significant risk of increased inflammation and spread of the infection into the new donor tissue. In most situations, PKP is postponed if possible until resolution of infection. However, even in a cornea that appears quiet, residual dormant cysts within the peripheral cornea may spawn renewed infection after PKP. After corneal transplant, protective, maintenance doses of medication should be used to help prevent the recurrence of the Acanthamoeba infection (Visvesvara GS, 1990). Be wary of recurrence with peripheral limbal cyst reactivation and infection of the graft. Continue topical anti-amoebic therapy. Steroid therapy (oral or topical) may help control inflammation after control of the infection has been achieved. Aksozek A et al. Resistance of Acanthamoeba castellanii cysts to physical, chemical, and radiological conditions. J Parasitol 2002;88(3):621-623. Alizadeh H et al. In vitro amoebicidal activity of propamidine and pentamidine isethionate against Acanthamoeba species and toxicity to corneal tissues. Cornea 1997;16(1):94-100. Chapter 7. Infectious Diseases of the External Eye: Clinical Aspects, In: Sutphin JE, et al.. Section 8. External Disease and Cornea, 2004-2005 Basic and Clinical Science Course. San Francisco : American Academy of Ophthalmology; 2004; p. 176-179. Jones DB et al. Acanthamoeba polyphaga keratitis and Acanthamoeba uveitis associated with fatal meningoencephalitis. Trans Ophthalmol Soc UK 1975;95(2):221-232. Larkin DF et al. Treatment of Acanthamoeba keratitis with polyhexamethylene biguanide. Ophthalmology 1992;99(2):185-191. Martinez et al, in Conner DH et al, editors. Pathology of Infectious Diseases, Vol 2, Washington DC;1997;p.1163-1176. Mathers WD, et al. Outbreak of keratitis presumed to be caused by Acanthamoeba. Am J Ophthalmol 1996;121(2):129-142. Meier PA et al. An epidemic of presumed Acanthamoeba keratitis that followed regional flooding. Results of a case-controlled investigation. Arch Ophthalmol 1998;116(8):1090-4. Moore MB et al. Acanthamoeba keratitis associated with soft contact lenses. Am J Ophthalmol 1985;100(3):396-403. Murakawa GJ et al. Disseminated acanthamebiasis in patients with AIDS. A report of five cases and a review of the literature. Arch Dermatol. 1995;131(11):1291-6. Visvesvara GS, Stehr-Green JK. Epidemiology of free-living ameba infections. J Protozool 1990;37(4):25S-33S. van Flink F et al. The role of contact lenses, trauma, and Langerhans cells in a Chinese hamster model of Acanthamoeba keratitis. Invest Ophthalmol Vis Sci 1993;34(6):1937-1944. Graff JM, Goins KM, Syed NA, Sutphin JE. Acanthamoeba Keratitis: 39-year-old contact lens wearer with persisting keratitis and pain. EyeRounds.org. posted December 4, 2006 ; Available from: http://webeye.ophth.uiowa.edu/eyeforum/cases/58-Acanthamoeba-Keratitis-Contact-Lens-Wear-Pain-Ring-Infiltrate.htm.